Scoring a deal on a designer handbag is like winning the lottery. Though it might seem like a miracle that you found a vintage Chanel 2.55 or Hermes Birkin for a bargain, how do you know that your new beloved designer bag is 100% authentic? Before you go shopping, get familiar with the brand and its products. 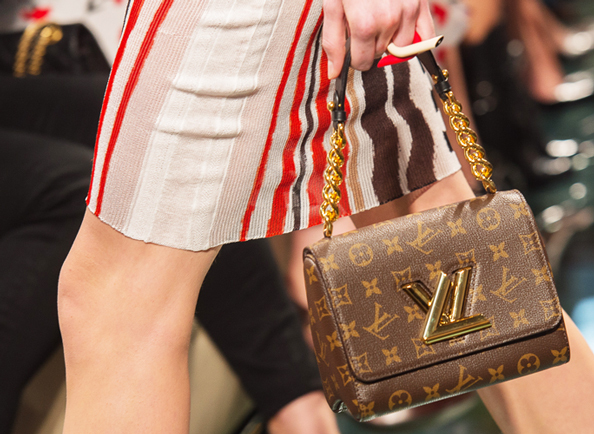 Stop into Louis Vuitton or a high-end department store, like Neiman Marcus or Barney’s New York, that carries designer wares to get a good feel for the craftsmanship before testing your gut at a consignment or vintage shop. The Material. Leather should feel dry and looked aged, depending on the wear. If it feels oily, slippery or sticky, put it back on the shelf. Any hardware decorations should feel heavy and never hollow. Sometimes, designer names are randomly printed on fakes to appear more realistic. Do your homework and research if and where the designer name is usually imprinted. Workmanship. Look for consistent and even stitching. Loose or crisscrossed threads are usually a sign of a fake. Take both an overall and close look at the bag to make sure the seams match. For instance, the quilting should perfectly align on a Chanel bag, while the pattern on a Louis Vuitton should continue from top to bottom. Lining. Since counterfeiters usually mock up fake handbags from pictures, the lining inside is usually a telltale sign of a bag’s true authenticity. Spotting this faux paus is also where using your previous knowledge from visiting the boutique comes into play; observe the color and any signature pattern to determine its value. Pockets. The presence of pockets or no pockets is another major burn for counterfeiters looking at photographs to create knockoffs. Be aware of pockets on the sides, back or inside the bag and cross reference with similar items that are real. Place of manufacture.You should never assume that all of a brand’s items are made in France or Italy. For example: Though it’s true that most Louis Vuitton products are made in France, items printed with bold cherry blossoms and smiley-face centers on the brand’s classic brown canvas was a collaboration between Louis Vuitton and artist Takashi Murakami that was made in Spain. Misspellings. An obvious one that really lets counterfeiters skate by, there is no doubt that a bag is fake if one misspelling or grammatical error is present.